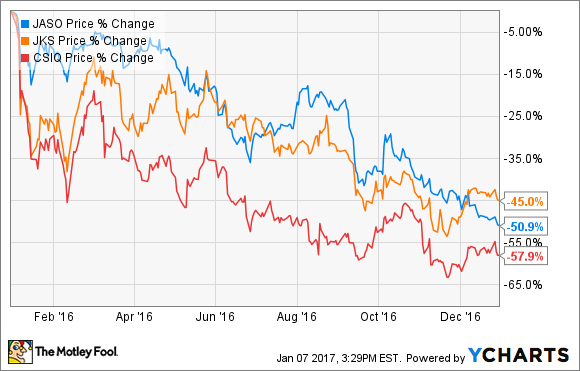 2016 was a year to forget for solar stocks, but the operational pain may just be getting started. 2016 started with a lot of promise for the solar industry. The U.S. solar investment tax credit (ITC) was extended at the end of 2015, and China was about to embark on a massive installation streak, driven by a high feed-in tariff. But last year wasn't as good as many solar investors had hoped. After Chinese installations tripled to 20 GW in the first half of the year, the country cut its feed-in tariff rate mid-year and installations plunged. In the U.S., the ITC extension had the side effect of pushing utility solar demand out to the 2018-2020 timeframe. When combined with supply expansions, the second half of 2016 and 2017 are expected to be very poor for solar operations. And that hit manufacturers Canadian Solar Inc. (NASDAQ:CSIQ), JA Solar Holdings Co., Ltd. (NASDAQ:JASO), and JinkoSolar Holding Co., Ltd. (NYSE:JKS) extremely hard, as you can see below. Exiting 2015, solar manufacturers were in a relatively stable position with panel prices fairly stable at $0.57 per watt, according to GTM Research, and demand for panels leaving most companies running factories at full steam. But when the bottom fell out of the market in the second half of 2016 due to the decline in Chinese demand and a lack of new U.S. utility projects, panel prices plunged to $0.40 per watt. In the third quarter alone, panel prices dropped 25%, catching nearly every manufacturer off-guard. And with installations expected to decline around 7% next year, there's no reason to think panel prices will increase soon. The result will be lower gross margins and lower utilization of equipment at plants, which could have a compounding effect that turns recent profits into losses in 2017. JA Solar, JinkoSolar, and Canadian Solar have all gone through large capacity expansions this year, with JinkoSolar and Canadian Solar adding nearly 50% to their solar panel capacity in the last twelve months. This comes at a terrible time for them and the industry, because every manufacturer will be fighting for customers based on price. And as margins fall their highly leveraged balance sheets are exposed. 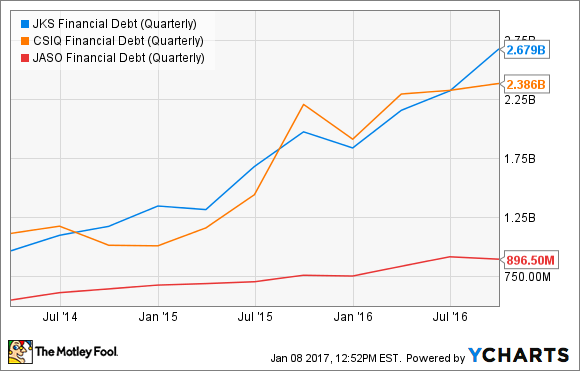 JinkoSolar and Canadian Solar, in particular, are susceptible in a downturn because they've more than doubled their debt over the last three years to over $2 billion. The challenges facing solar stocks in 2016 will become operational challenges in 2017 as falling panel costs hit income statements. And there's no real indication JinkoSolar, Canadian Solar, or JA Solar are cutting operating costs to adjust to the new market reality. In fact, they're collectively completing a large expansion in capacity today. Solar energy has a very bright future, but I would be cautious jumping into these manufacturers today. They may have a very rough year ahead.